Roseville Plumber, Plumbing Service & Repair | Edwards Plumbing, Inc.
Edwards Plumbing has been providing Roseville with precision Plumbing Services and Repair for over 32 years. Edwards Plumbing of Roseville has the experience and knowledge needed to handle any of your home Plumbing Services and requirements. Licensed, Bonded, Insured and recognized as Roseville’s #1 Local Community Plumber, Edwards Plumbing is able to complete plumbing jobs quickly and efficiently, specializing in service and improving the quality of your home. Edwards Plumbing is family owned and locally operated. At Edwards Plumbing, we are committed to providing you with a superior experience as well as clean, fast and friendly service. Customer satisfaction remains at the forefront of our business and we guarantee it 100 percent. Edwards Plumbing always arrives on time, prepared and ready to leave your home’s plumbing concerns in better working condition than when we arrived. We offer a full line of Plumbing and Drain Cleaning services to our Roseville customers. From service and installation, to repair and completion, Edwards Plumbing can do it all. 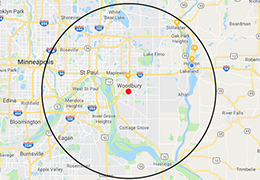 Give Edwards Plumbing a call today at 651-769-1192 to schedule your next service or complete our Proposal Request for by CLICKING HERE. 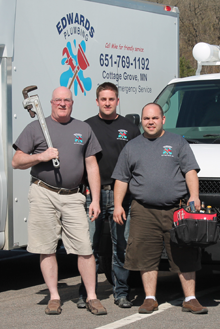 In the event of a plumbing emergency, call the office at 651-769-1192. This number is answered 24-hours a day. You will receive immediate one-on-one personalized service. Exceptional service with quality work and...‎‎ I've used Edwards Plumbing repeatedly and have nothing but good things to say about them. They were fast, courteous, and professional and the quality of work that was done was exceptional. I have recommended Edwards Plumbing to family and friends and would recommend them to anyone looking for plumber they can trust. ABSOLUTLY AMAZING CUSTOMER SERVICE‎‎ The un-imagionable happened to me, coming home from work to a flooded basement. Thanks to an old water heater, I did shop around for rates and when I called Mike he assured me he was the cheapest around and did not charge extra for weekends. He was very friendly and extremely clean. I will recommend Edwards Plumbing to anybody who ever needs a plumber. Thanks again! I recently decided to update our bathroom, and started getting bids from local plumbers. When I contacted Mike from Edwards Plumbing he was very polite and exciting to talk to. He came out to the house the day I called him, and gave me very great quote...Mike made it look amazing. Needless to say it was the best thing me and my wife did. I just wanted to let everyone know how great it was working with Mike. Thanks again Mike! "Dedicated to Excellence in our Profession and Our Local Communities"